A powerful and well-balanced saw that is designed exclusively for fire, rescue and emergency work service. When conducting rescue operations, time is of the essence. Emergency workers need a dependable chain saw to access trouble spots, provide additional ventilation, or assist with Rapid Intervention Teams (RIT) operations. 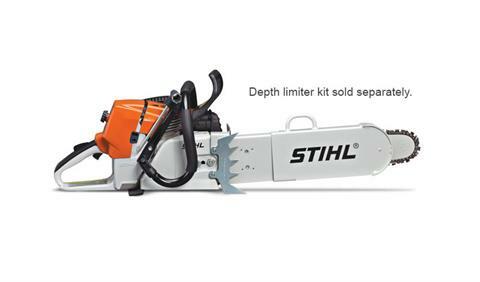 With the input of professional firefighters, STIHL® designed the MS 461 R Rescue specifically for fire, rescue and emergency services work. With features like an extra-large starting handle (for use with fire gloves), an extended chip deflector, a built-in tool holder and muffler, this saw is a valuable asset for first responders from coast to coast. When time matters, this rescue saw matters. ADJUSTABLE AUTOMATIC OILER: The Adjustable Automatic Oiler allows the user to adjust the lubricant of the guide bar and saw chain for different bar lengths and cutting conditions. WRAP HANDLE: Saw can be used in multiple positions for felling or limbing with hands in the proper positions. INTELLICARB™ COMPENSATING CARBURETOR: Measures air on clean side of air filter and adjusts metering diaphragm in carburetor. Keeps RPM levels even when filter begins to clog. EASY2START™ SYSTEM: This starting system reduces the strength and effort needed to start the engine.